This is the first time we’ve let you know about what’s going on in Warsaw this year, so here is a collection of some of our firsts in January 2019. After the eight of us gathered in the dark the guests entered the tea room at 7 AM to welcome the new year. 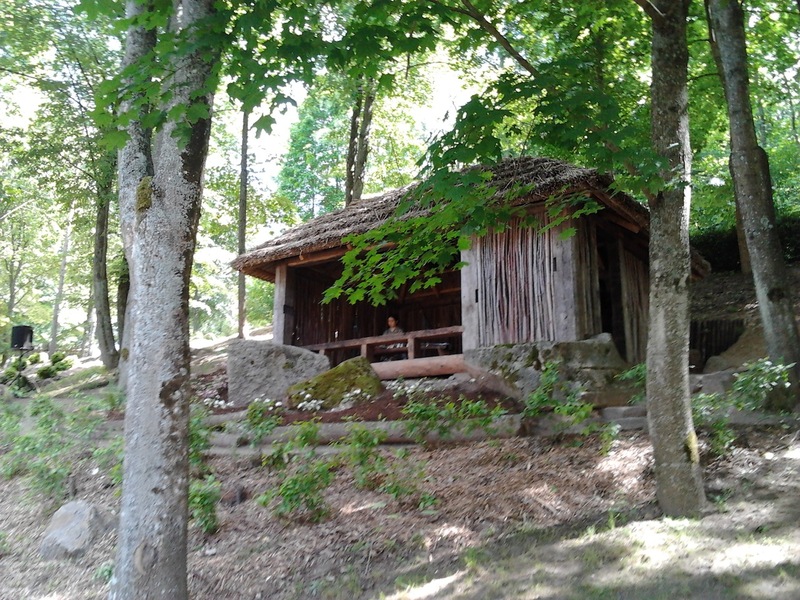 The room was prepared for laying the charcoal and once all the guests were settled the fire was built. Next we shared some food. When finished we left the room. After the hosts prepared the flowers and thick tea we re-entered and shared both thick and thin tea. We’ve been doing this intimate gathering at sunrise on the 1st for a few years now and it always fills us with warmth of spirit and inspirational energy for the coming year. Thanks to everyone who made this a special morning. Ula-sensei has been making sure everyone has a bite to eat before tea lately, even at keiko. So a small tray of food was served. Then we continued with our regular practice of various thick and thin tea. Thanks to our dedicated students for their continued diligence and patience. 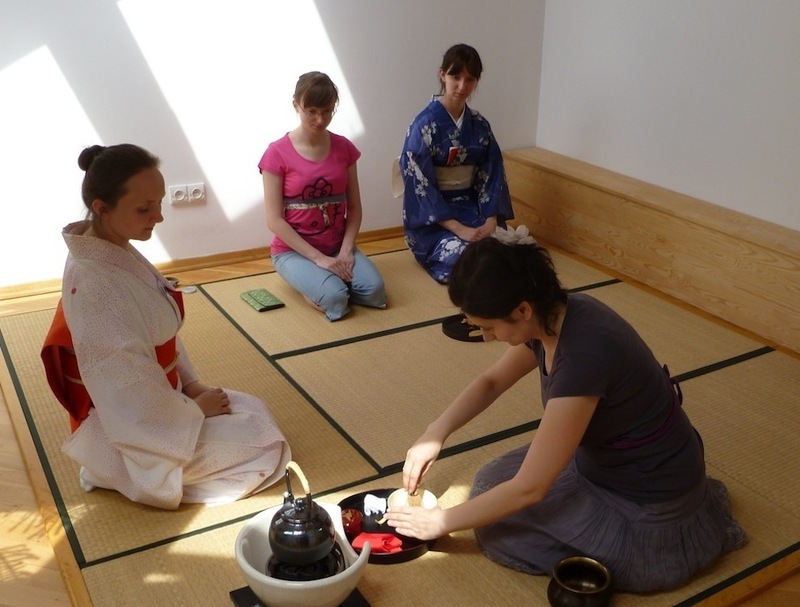 Every year the students of the Urasenke tea course at Warsaw University get to drink thick tea in celebration of the new year. It’s a nice chance for them to take part in some aspects of the new year celebrations. 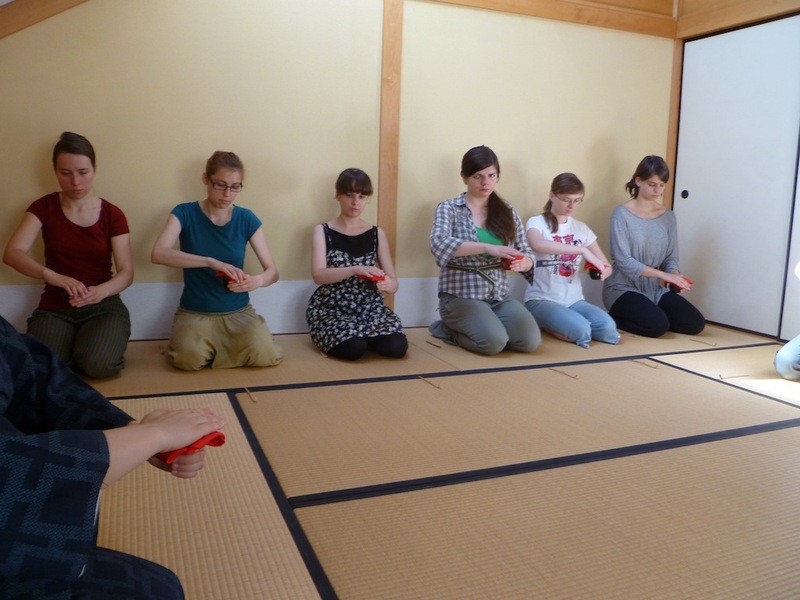 Afterwards several of the group’s regular students got to take their first tries at daisu temae. It was great having them come to help with the university students. For the opening of the celebratory year commemorating 100 years of open diplomatic relations between Japan and Poland we were asked to make tea for the guests in attendance at the Japanese Ambassador’s residence. We made tea simultaneously in the tea room and at the misonodana table. It was a little too busy to take any pictures while making tea, but here is most of our team. It’s always a pleasure to work with the Ambassador and the staff of the Embassy. Each year it’s our pleasure to invite those whom we work with and rely on for a new year celebration, in the tea fashion. Staying up late preparing food and sweets is a regular task before any tea gathering, especially when you’re serving many dishes to many people. Ganmodoki (imitation goose – because it’s tofu based) for the soup. 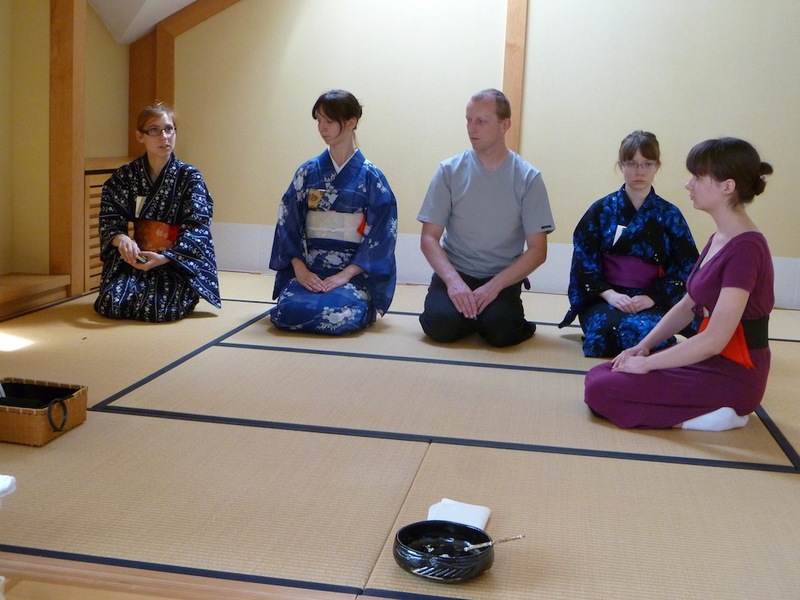 The guests, especially the Japanese ones, seemed to enjoy it. Thank you Ania! Thanks to everyone for all the help. 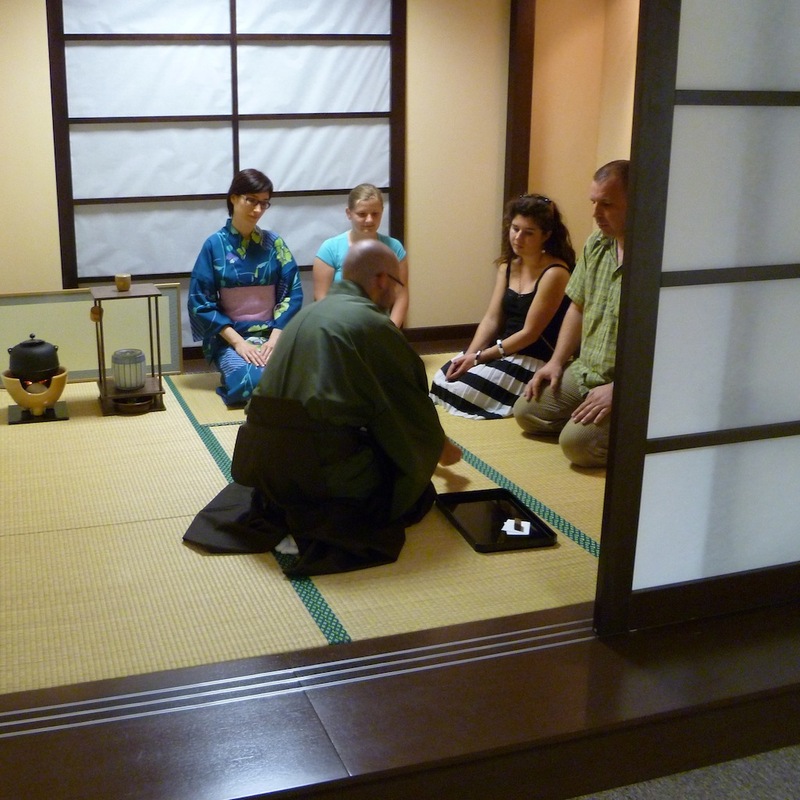 The first seki, or group of guests, doing haiken of the tea utensils. Guests enjoying some sake with their food. “Repairing” the fire for the second seki. Sweets for the thin tea, pines and cranes. Yokoe Masato-sensei was a guest during the second seki, but had come from giving shamisen lessons and was so kind to play a few songs for us. Once we served all our invited guests we did the same for ourselves under the full moon. Looking forward to many more tea events. And so it has started, the New Year, with Tea on the 1st of January, 7am. Warmest thanks to our gracious Guests who made this meeting possible! All the best for the New Year! So many events skipped, I’ll try to fill in the blanks over time. 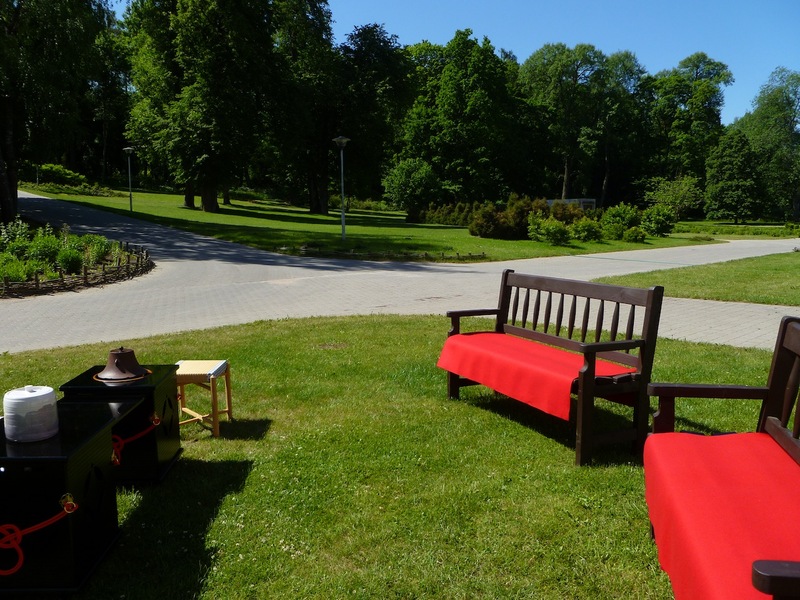 Let’s talk about the Warsaw Summer Workshop while it’s still fresh! This year, somehow, the word about our workshop continued to spread and we were privileged to receive participants from many different places. 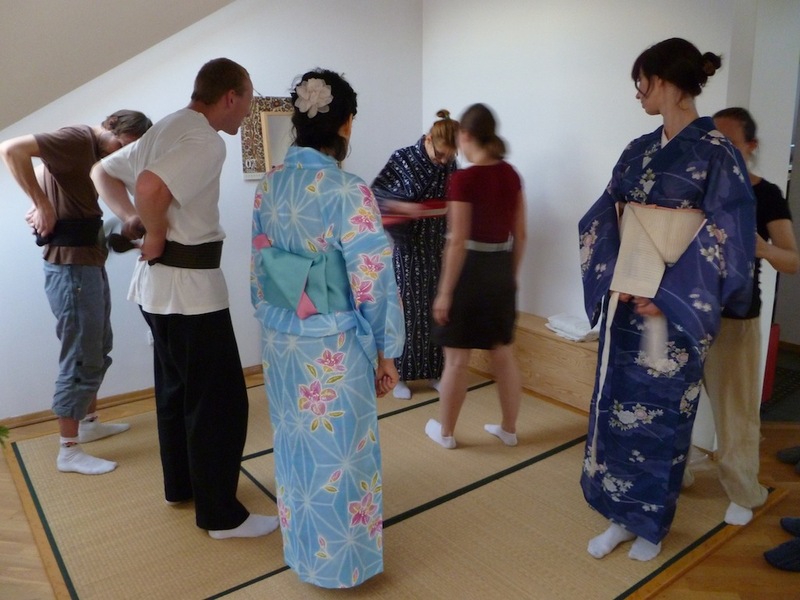 Of course some of our own members were here to host six members of the Krakow group along with one from Hungary, two from Finland, another Finn who came all the way from Kyoto, and an American from London. All together about 19.3 participants (that’s including 7 month old Gabriela and our fantastic cook/masseur Marcin). One reason we were able to draw a member from Japan is because we focused heavily on practicing the shichijishiki this year. 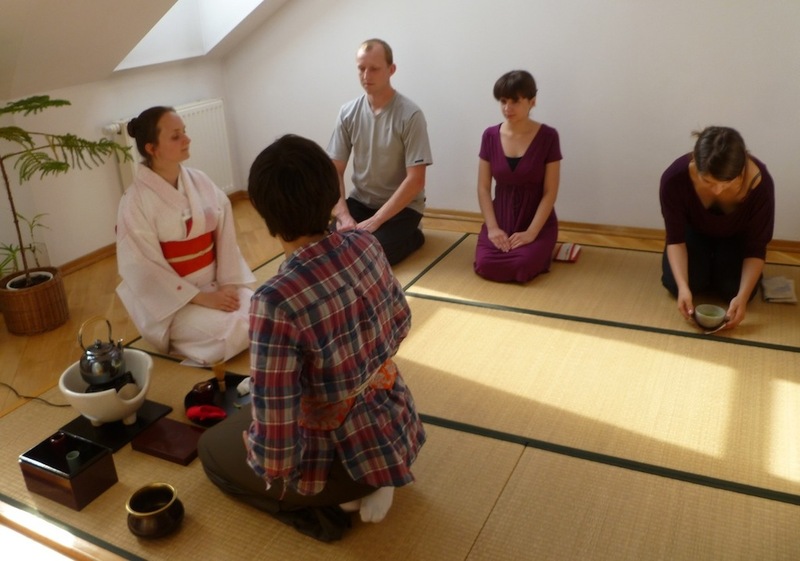 The shichijishiki are a set of group forms devised in the 18th century in part to enlist many participants in one practice and based somewhat on the seven practices in Zen temples. and some food for sustenance before delving into all the forms. These group forms, like any other, require repetition in order to learn; however, they require a knowledge of all the basic forms as well as having a sufficient number of people in order to practice them. 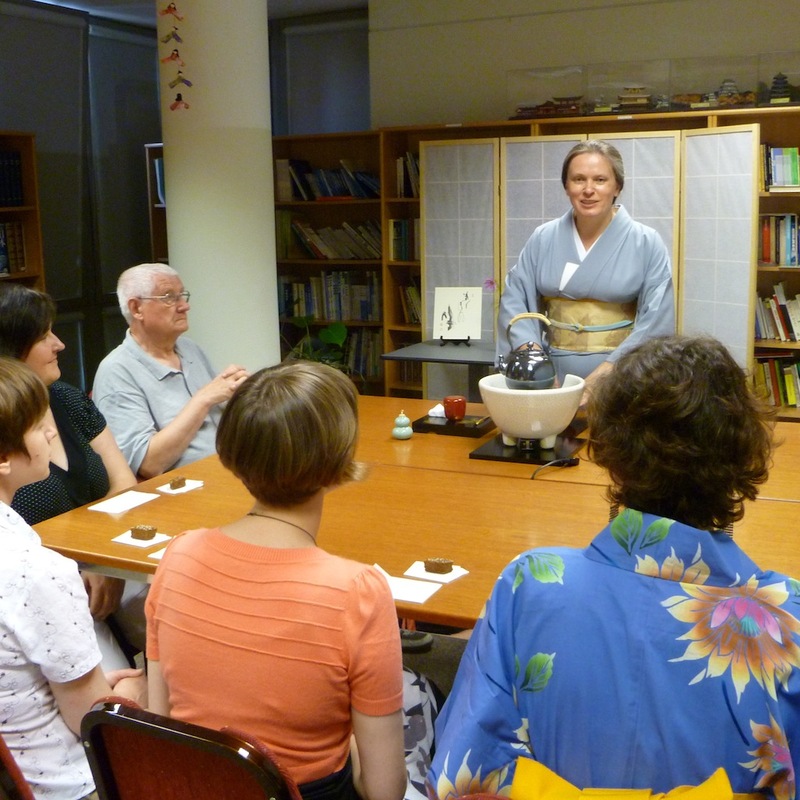 Each night we did our best to try out other aspects of chanoyu, making Japanese sweets, making tea scoops and making kobukusa. Goldfish made of sweet bean paste swimming over sweet sesame sand. 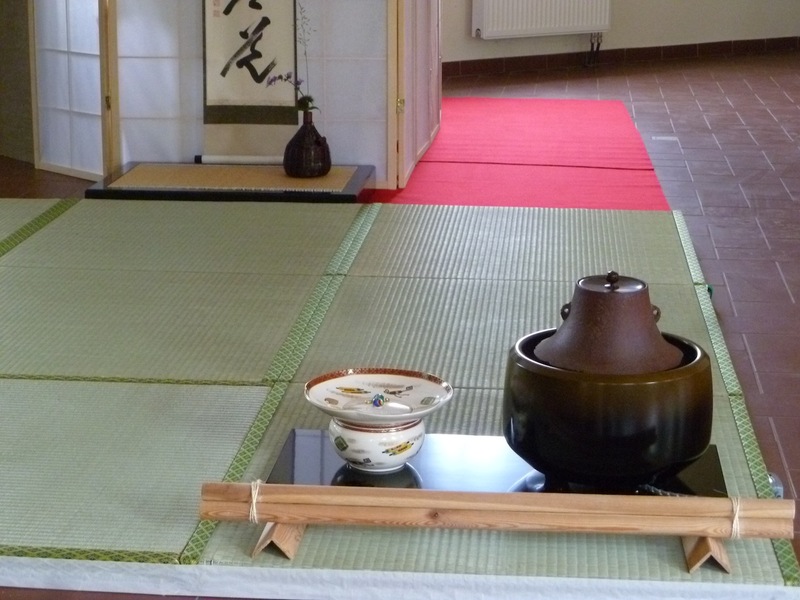 The first day, as always, we began by refreshing the basic elements of tea practice, sitting, standing, walking, bowing, and preparing the utensils. We then discussed the history of the group forms and talked a little about each one. That afternoon we practiced the most common of the group forms, Kagetsu. 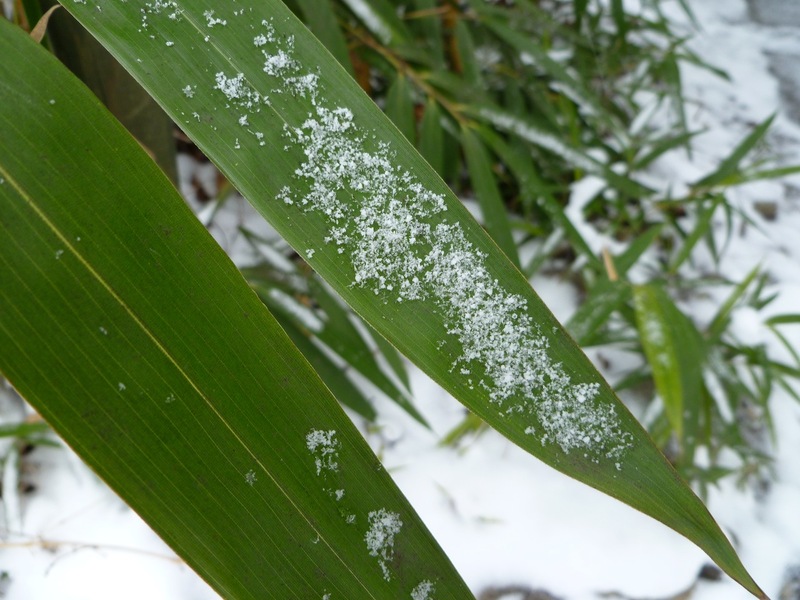 Kagetsu is a form that can be practiced in many different ways and in which each participant must be ready to change places with any other to do whatever task is at hand. 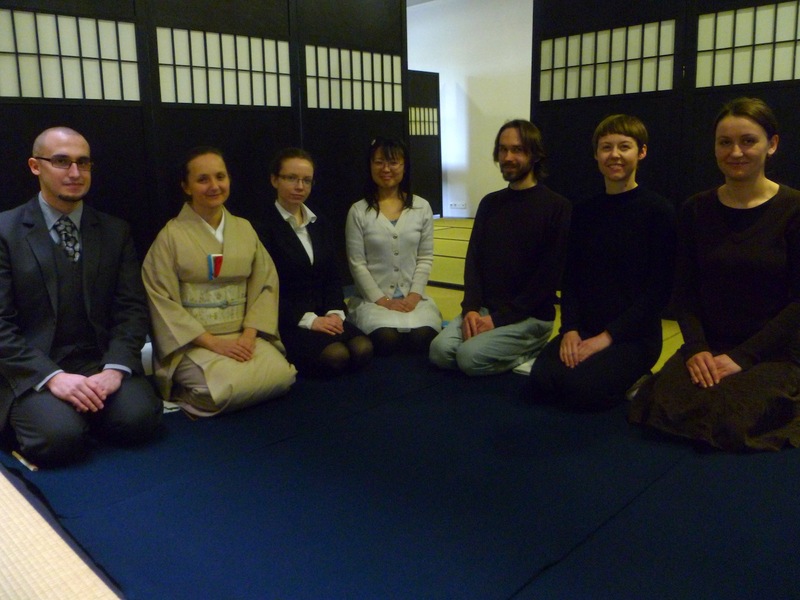 The second day was spent at Kaian, the Japanese tea house at Warsaw University. There we practiced more Kagetsu, specifically the types that can be carried out in a 4 1/2 mat room. We also did a little practice in the 2 3/4 mat room for some close tea sharing with each other. On the third day we hit the more difficult forms, or at least those less practiced. We started with Shaza, a form where each person takes care of a different task; arranging flowers, making the charcoal fire, preparing incense, making the thick tea, and making the thin tea. 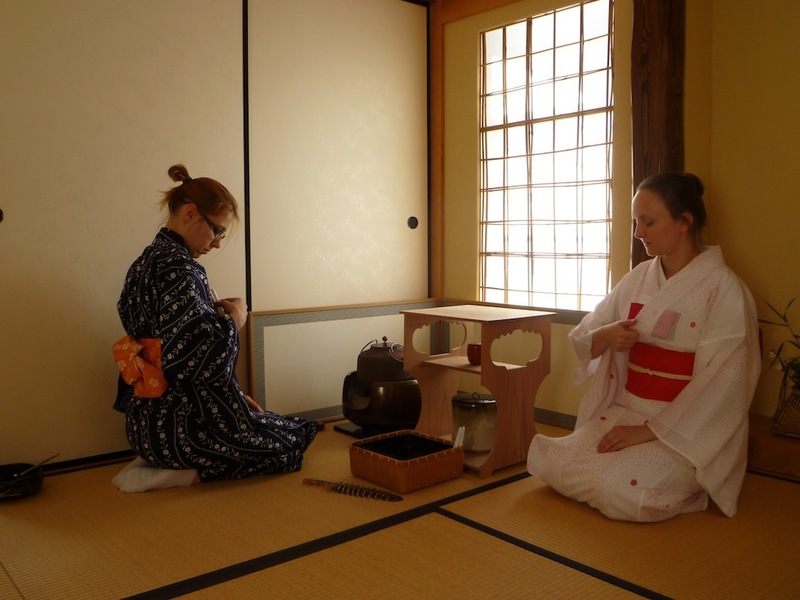 Next we practiced Chakabuki, a form where each person drinks two different thick teas, the consumers are informed of the names of each. Then three more thick teas are prepared randomly and each person must guess which tea they are drinking, the first, second, or a third mystery tea. 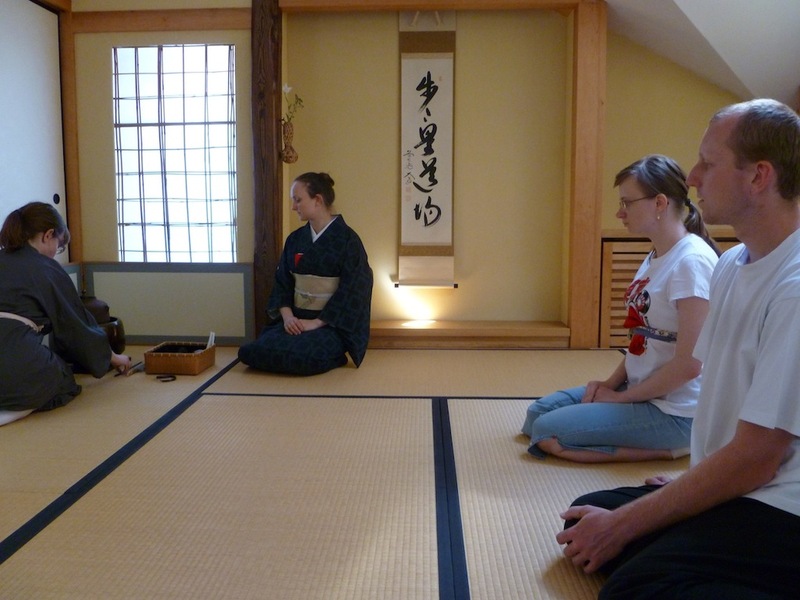 In the afternoon we practiced Senyū. 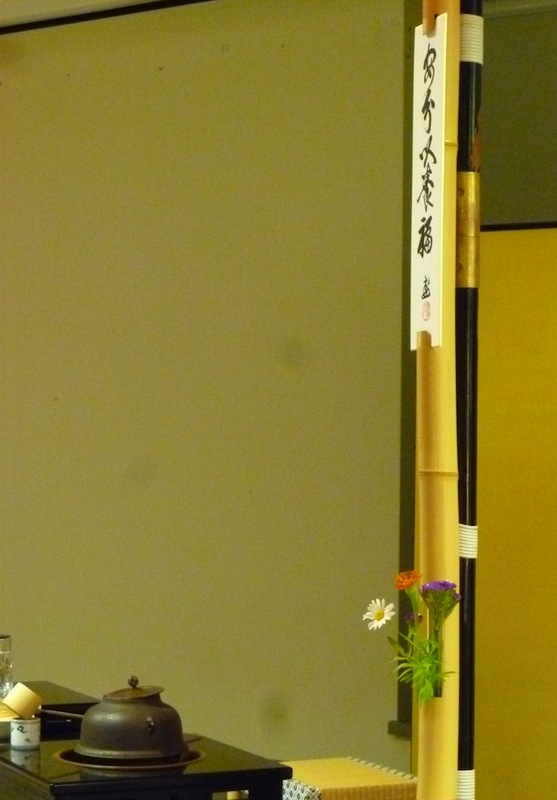 This form is somewhat similar to Shaza above except each element is modified and/or expanded on: instead of one person arranging the flowers everybody takes a turn doing it, the charcoal fire is done honsumishomo style so the guest actually only puts in the charcoal, two types of incense are prepared, thick tea is made for everyone, and the thin tea is carried out as in Kagetsu. Of course anytime there was extra time we tried to fit in an extra Kagetsu. One the last day we practiced a form called Ichi-ni-san which enables each participant to give a review of the tea form done for them by the host. 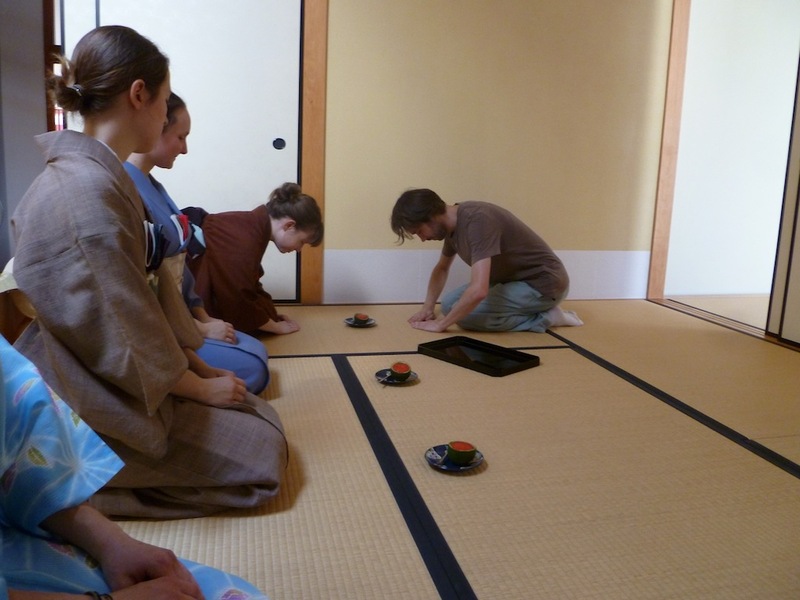 We also practiced Kazucha, a form wherein each participant will have a sweet, make tea and drink tea all in random order. We then used this form in our closing tea gathering that afternoon. 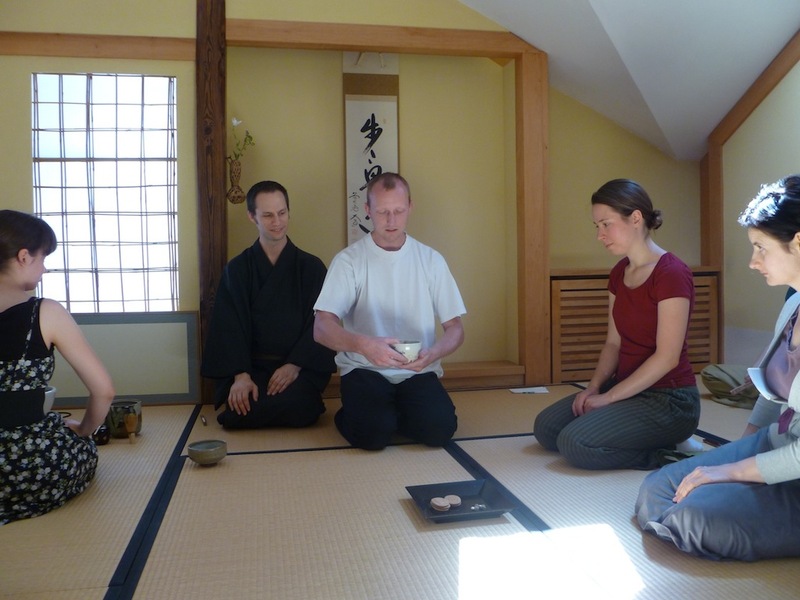 The closing chakai started with the charcoal, an excellent bowl of thick tea, and then everyone participating in Kazucha for their thin tea. We were busy from early morning to late night everyday but we still tried to have a little party to wrap up the event. As usual, most everyone was too tired to notice. That’s how we can tell if people had a good workshop, when they pass out when it is over. Thanks to everyone for making the workshop another special event and for coming together to share tea with us here in Warsaw. See you next year! Hey, what are you doing to my foot? Our friend Ahmad of Chanoyu Arabia relocated to Cairo and after some settling in invited us to share tea with the people there. We held practices for thirteen days and were also able to travel to Tunis, a pottery town in Fayoum, about three hours drive from Cairo, where we were able to show the local artists how we use ceramics in chanoyu. The Cairo tea group has a long history and is currently trying to get more active, and they showed it, many members came several times during our stay. There are of course Egyptian people studying tea as well as Japanese, we also met other people from diverse regions all living in Cairo that Ahmad has been getting involved in tea. Some people are drawn to chado from very young ages. Noor, commonly known as Hanto-chan is eagerly mastering every aspect. The trip was wonderful, the people friendly and receptive, tea everyday, warmer weather, a fantastic and giving host. A truly magical experience we hope to repeat soon. Thanks Ahmad and everyone in Cairo. 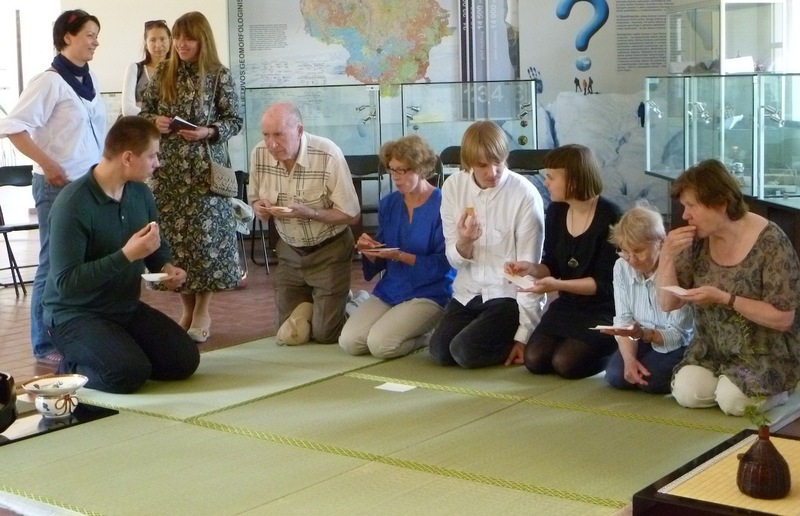 This year marked the fifth and fifteenth anniversary of our tea group in Warsaw. 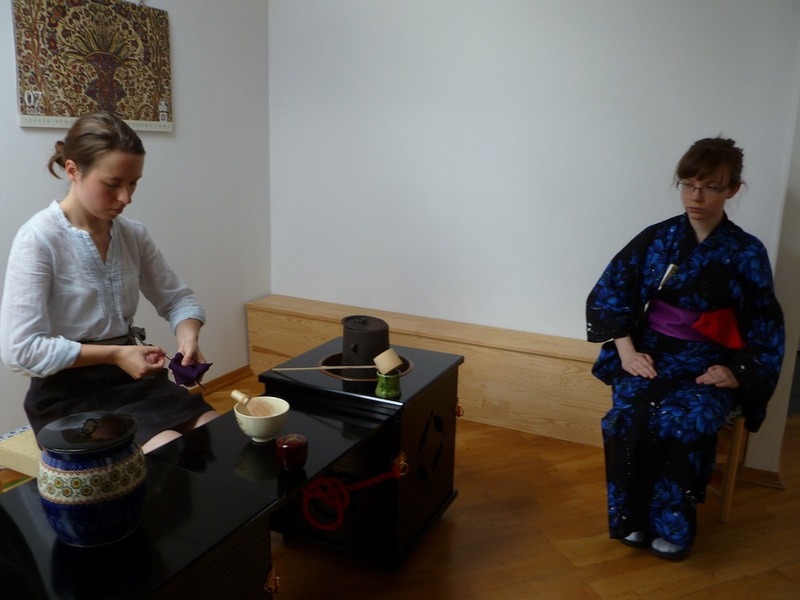 It has been fifteen years since Iwona returned from Japan after beginning study with Sugimoto-sensei and then began sharing tea culture with others in Warsaw. 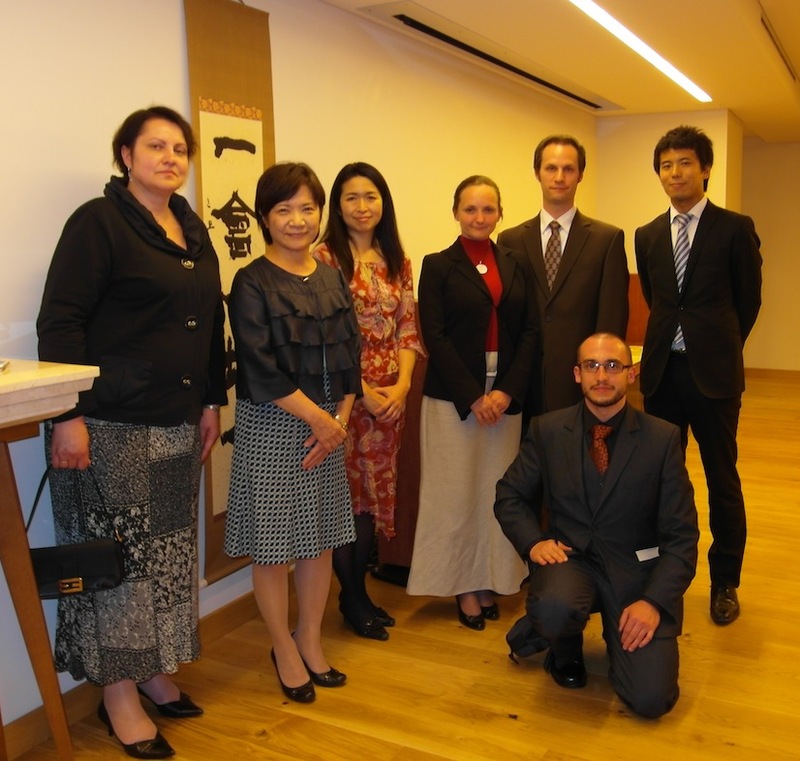 Five years have passed since we became recognized as an affiliate of Urasenke Tankokai with endorsed Urasenke teachers and support. Ordinarily we have had our anniversaries at our practice space but this year, in order to celebrate with a wider group of people we planned the event in a public location. The palace itself was built in 1720 and is considered one of the most beautiful buildings in Warsaw and the first building to have such a roof rather than the tiles that were customary before then. The rooms we shared with our guests are filled with an exquisite Oriental Carpet Exhibit that created an intensely warm and cozy atmosphere. Earlier in the summer we held a tea presentation in collaboration with the palace and the wonderful staff there allowed us to hold this event using their facilities. The guests were a combination of our own members and guests along with those invited by the palace. Sugimoto-sensei attended from Japan along with several of our other honorary members. 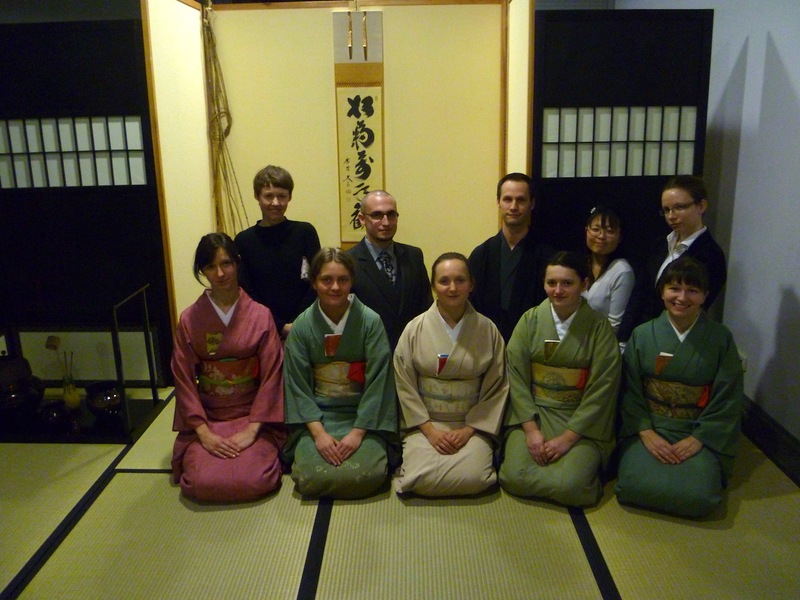 After our president Urszula greeted the guests Sugimoto-sensei, with Anna Z. translating, read a letter of congratulations from Sen Hounsai and Sen Zabousai, the fifteenth and sixteenth generation heads of the Urasenke tradition of tea in Kyoto. This was followed by a short message from Dr Jadwiga Rodowicz-Czechowska, recently returned Ambassador to Japan from Poland. 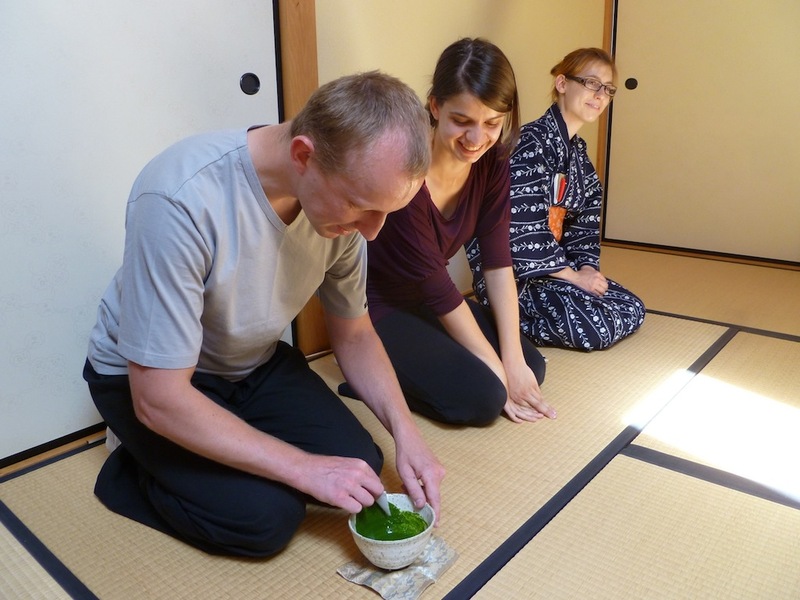 Next we conducted a tea making presentation in which Aaron and Damian offered tea to Sugimoto-sensei, Krzysiek and Misia while Ula explained a little for those new to the process. 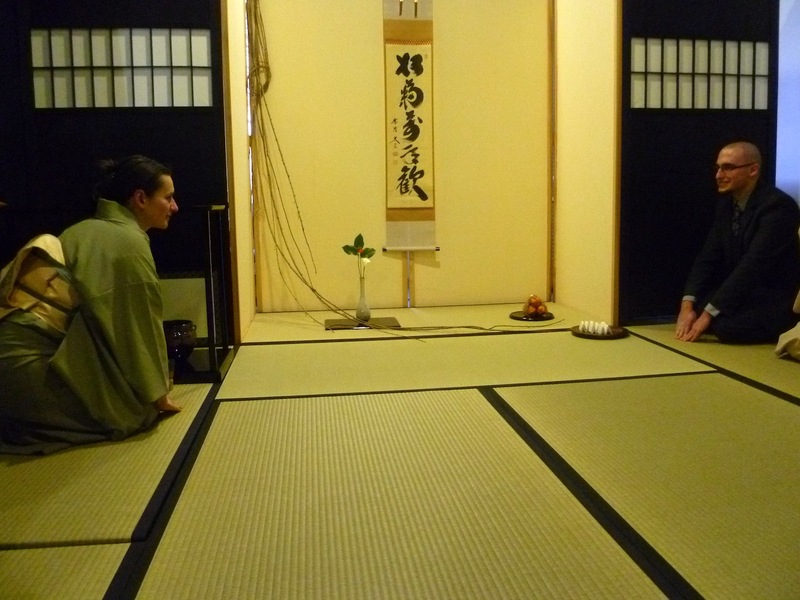 Next, as the tatami on the stage were exchanged for a misonodana during a quick intermission, the guests were served their sweets. 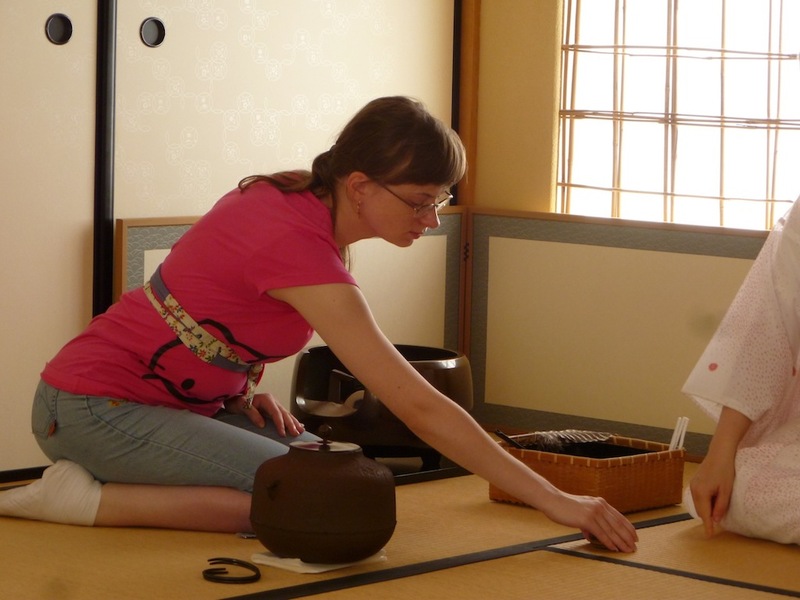 Then while Agata and Marta made tea on the stage the rest of our group served everyone assembled their tea. Lastly, thank you and congratulations to all our members for coming together and making this another special event. Looking forward to continued Tea sharing for many years to come. This was already our 6th Summer workshop, how did that happen? Every year we have great participants and a lot of fun. 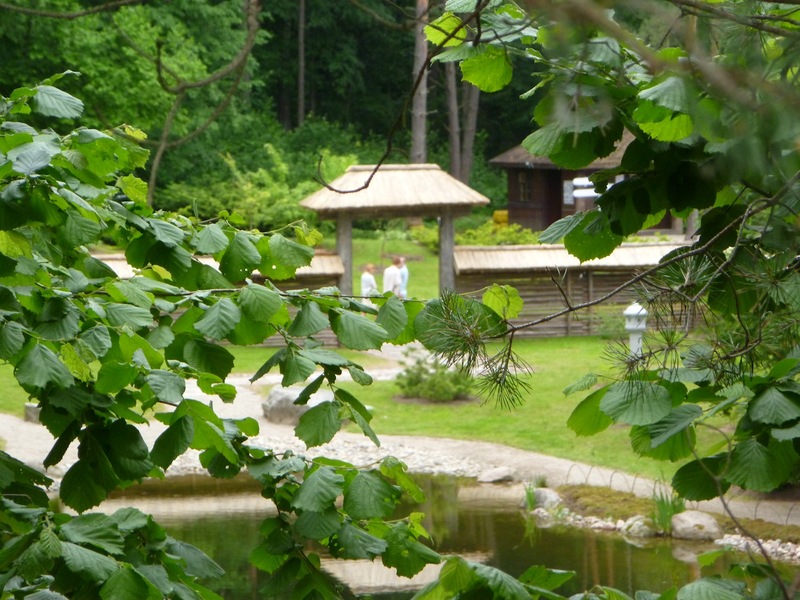 The schedule for the four days began each morning with zazen (sitting meditation) followed by a short session of group exercise, breakfast, a few hours of practice, lunch, then a few more hours of practice followed by more zazen, dinner and some evening activities. It was tough but many participants sleep on site so the 6:30 meditation isn’t too bad, right fellow non-morning-people? Every night we made sweets for use the next day, additionally each evening had a different activity for the participants. 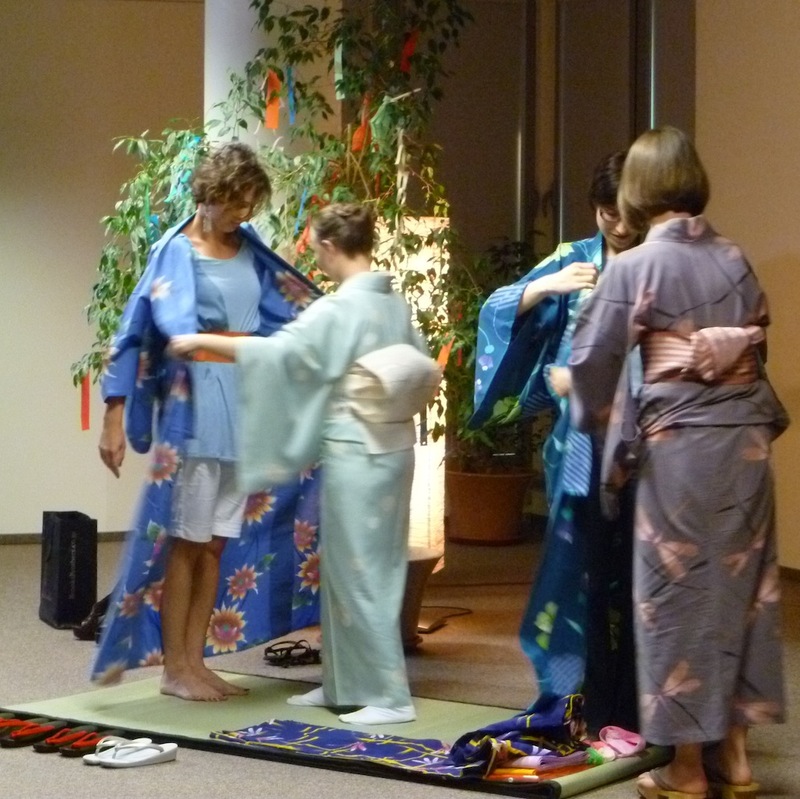 The first night we practiced how to wear Japanese clothes, especially obi (belt) tying for kimono and yukata. One night we had our friend from the Japanese Embassy come and give a workshop on furoshiki, including a lot of hands on training. 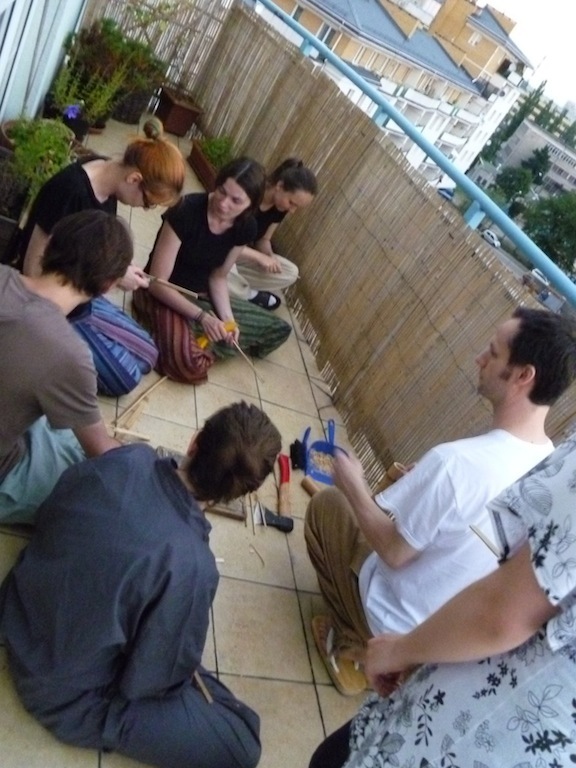 The third night we made chashaku (bamboo tea scoops) which turned out remarkably well for most everyone’s first attempt. By splitting up from time to time we were able to include temae from many levels and using different utensils. After lunch on the last day Damian and Marta hosted a tea gathering for the rest of us. They prepared a little more food (Damian’s excellent creation) along with refreshing sweets (wonderfully creative by Marta) before serving thick and thin tea in a combined form called tsuzuki usucha. After all those days of work it was almost relaxing the last evening as we all celebrated the conclusion of the workshop. Simultaneously Ula and Aaron packed for a trip leaving the next morning and several participants finished carving their tea scoops. It was non-stop and a great time. Now what about these requests for a Winter Workshop? 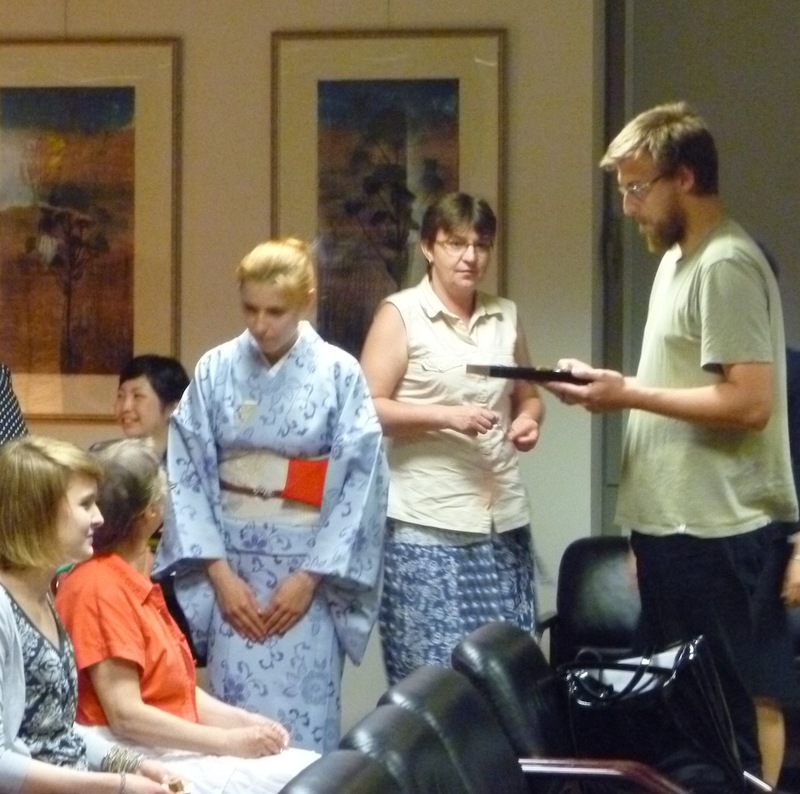 Invited by the Japanese Embassy, on the 5th of July we participated in the very rare occasion to help fulfill a dream. 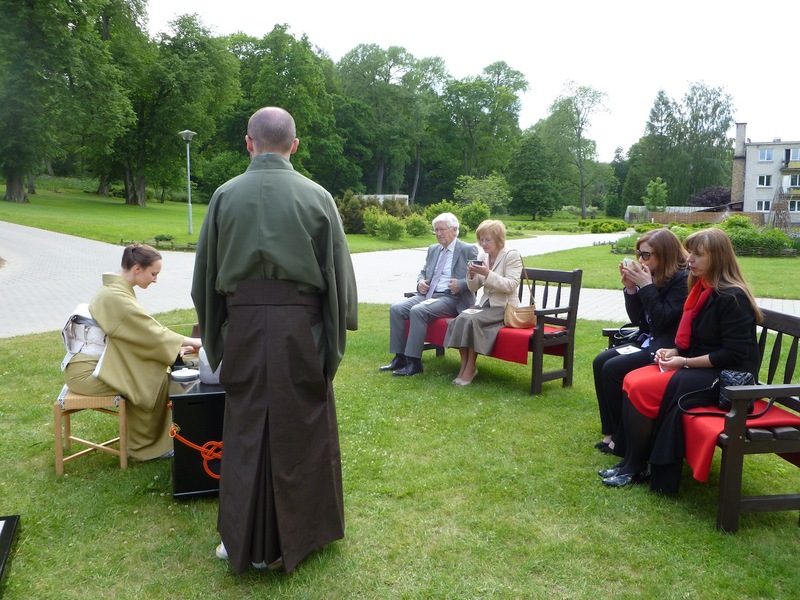 Monika Tomaszewska (in blue kimono) wanted to become the Ambassador of Japan to Poland for a day. And thanks to the I have a Dream Foundation, she did. Ambassador Yamanaka gave up his position for a day and together with his wife accompanied the new appointee throughout the evening. Monika’s address to those gathered had a professional and at the same time heartfelt warm ring to it. Tanabata, the Star Festival, is a Japanese celebration dedicated to fulfilling dreams. A festival of love and hope. 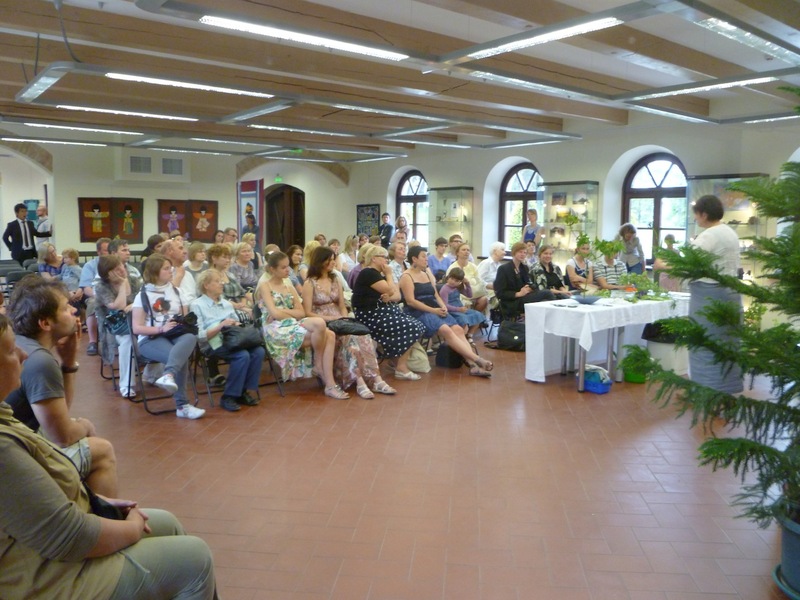 All our numerous guests this day joined in cordial atmosphere of this special event. In the end some of the guests, after on the spot training, helped us to serve everybody sweets and tea. 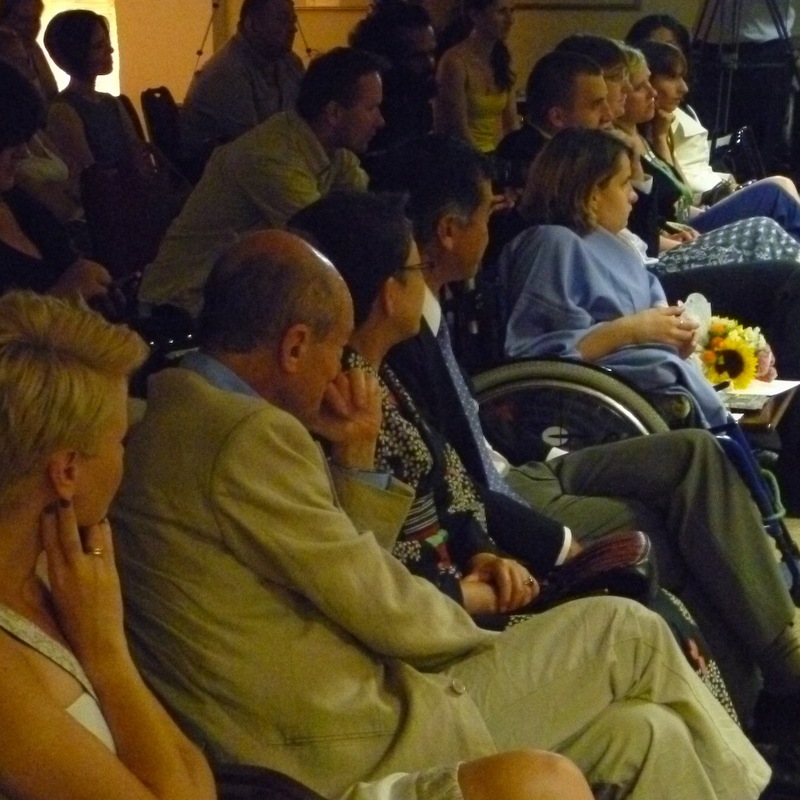 A joyful event, great guests, thanks again to everybody who helped with it’s organization. 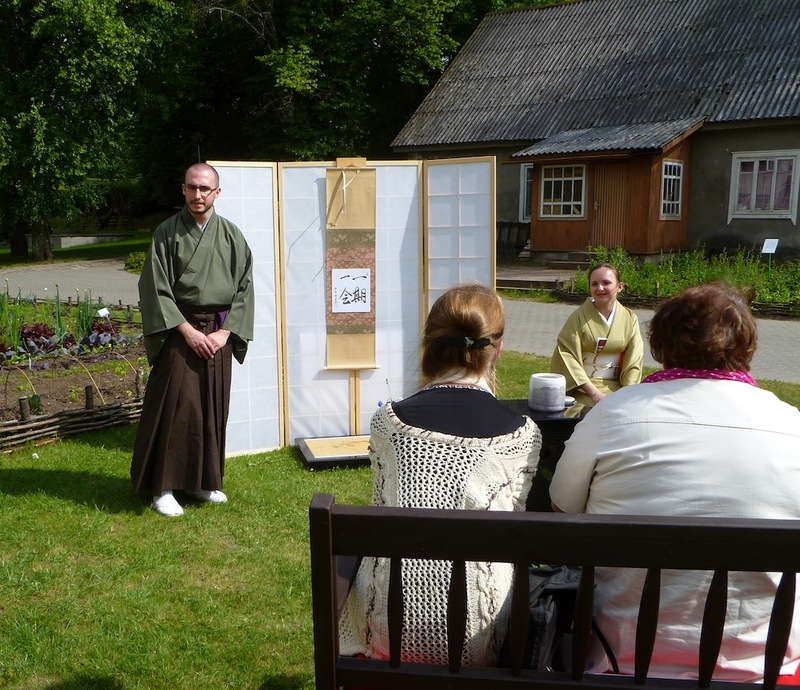 In June, the Japanese Embassy in Lithuania asked us to help them celebrate the opening of a new Japanese garden within their botanical gardens in Vilnius. Krzysiek, Ula and Aaron made the trip in order to share tea at this festive occasion. The drive was pleasant and not overly long. 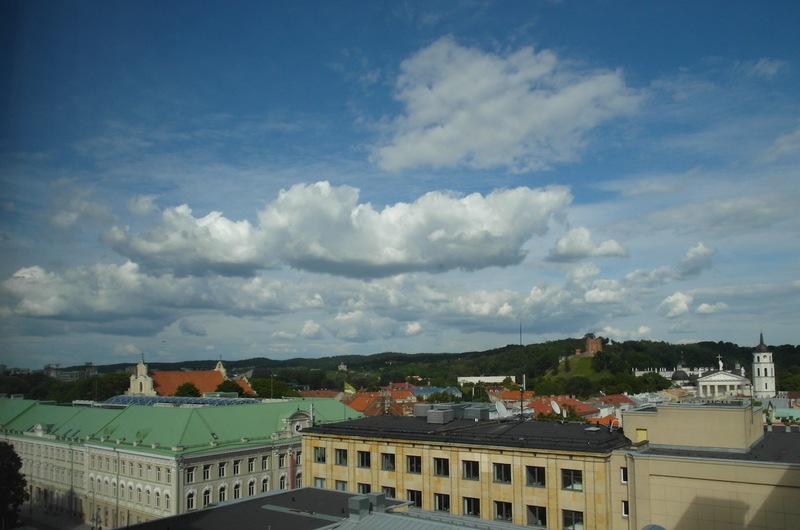 We took a day for driving each way and two days in Vilnius. At the garden we were shown around and chose a nice spot outside where we made tea for the special guests who were there to view the garden the day before the official opening. After the VIP group was served all the attendees were invited to sit with us and share the beauty of the garden. That night H.E. Ambassador Shiraishi invited all of us who had come to help to a fine dinner. and settled in to share a sweet and tea with us. 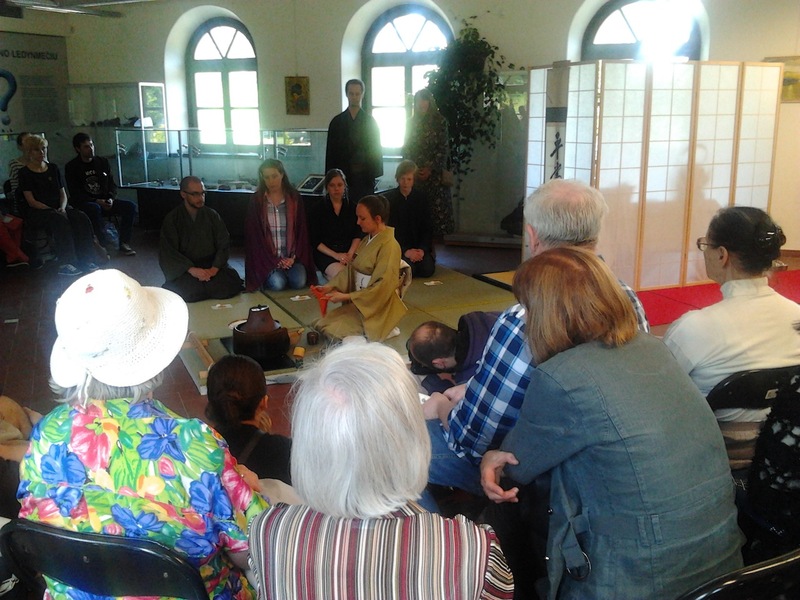 Everyone seemed interested in hearing about Japan and tasting the tea, we noticed several people mentioning magic and “reading” the remains of the tea in the bowl, it seems Lithuanians might be living close to nature and open to powers beyond the physical realm. 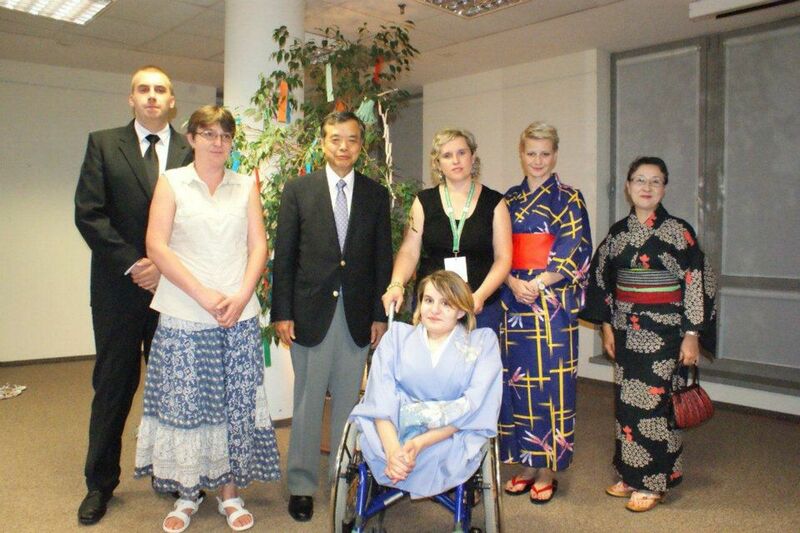 Luckily we had a helper from the Japanese Embassy in Lithuania who helped us serve all those guests. 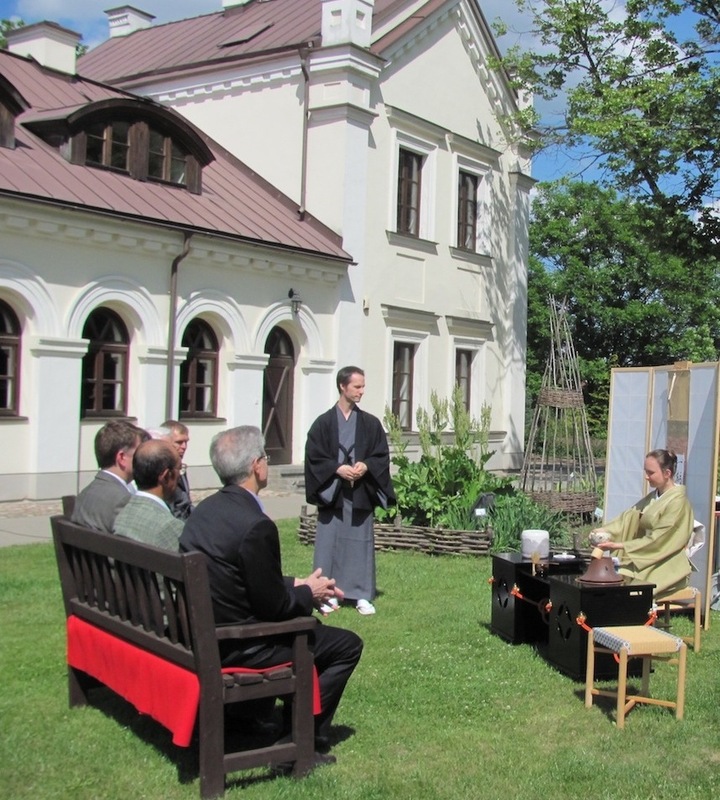 Thanks to Ambassador Shiraishi and all her staff who made this a great event as well as a fantastic memory of a rare chance for us in Poland. Vilnius was a pleasure to visit with a wonderful old-town full of friendly people. 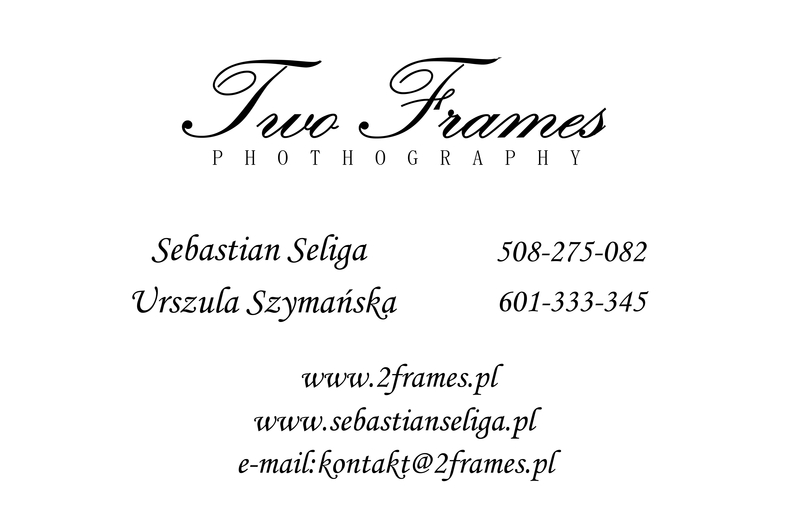 We hope to share tea in Lithuania again and recommend a trip there to everyone.